This entry was posted in Stocks Reservoir Fishing Reports on April 30, 2017 by staff. Sport: It was another big fish day Stocks with three double figure fish caught and a few more that were getting close. We saw good numbers being caught as well. The trout were high in the water and willing chase, which leads to really exciting fishing, especially when you have a monster bow-waving after your flies! The vast majority of the anglers fished from the boats today and the northern end of the reservoir was most popular from the Causeway along the Northern Shallows to the buoy line. Ron Melling took eleven good fish in just five hours fishing open water bend Gull Island Ron found olive crunchers most effective. Paul Bebb and Rob Shelton had twenty three trout between them on cormorants and cat boobies pulled through the surface on floating lines. Derek Moore and Felicity Appleton had a great session. They landed twenty six trout between them but their catch included two double figure fish and another of 9lbs. Felicity’s 10lb rainbow fought particularly hard before it finally came into the net and it was her second double in two days! They fished the Northern Shallows and the Causeway. Bob Fitzpatrick and Steve Bland had fifteen fish, they concentrated on trying to the trout chasing and found them willing to oblige. They caught along the buoy line at Phil’s Flats. Tony Newman caught this 8lb rainbow from the spillway on a damsel pattern. Felicity Appleton has had 18 fish and two doubles over two days. This entry was posted in Stocks Reservoir Fishing Reports on April 29, 2017 by staff. (results table below).There were also two tagged fish caught today winning the lucky anglers a greys GR50 fly rod and 1 £100 tackle voucher(pics below) Our own season ticket holder Felicity Appkleton also had a red letter day with 10 fish to the boat including a monster of 10lb 1oz well done on your first double Felicity. On the bank season ticket holders Anton Gysber and John Fletcher started the day off with six fish each in a short half day session, Anton caught his fish on a mix of Cracton nymphs and orange Nomads. John caught his on a booby called a ballerina designed by his granddaughter. Again on the bank Mick Grenhalgh had 8 fish again on a half day ticket, Mick found bell point to be his best area and caught on cormorants and cats whisker. Ken whiteside has been at it again with his UDF fly catching 9 fish from Bell Point and Hartleys on a floating line. Ken’s catch included a rainbow of 10lbs 4oz. This entry was posted in Stocks Reservoir Fishing Reports on April 28, 2017 by staff. NOTABLE CATCHES: 10+ for Steve Bland, Bob Fitzpatrick, Elliot Horrocks, B Stanley, Neil Heath and Graham Child. NOTABLE BAG: 5 fish weighing 18lb 4oz for Frank Bond. BEST FISH: 12lb + 10lb 12oz for B Stanley, 12lb + 2 10lb 8oz for Graham Child, 11lb 8oz for Neil Ashworth. BANK ROD AV: 13.00 fish per angler! BOAT ROD AV: 18.00 fish per angler! Sport: Stocks was on fire today with the trout in a feeding frenzy. See the rod averages. Not only were there great numbers of fish caught but 6 doubles were also landed. Mr B Stanley had his best day ever landing well over 10 fish including 2 super doubles and others of 7lb and 6lb. He fished along the bank from the jetty to Bell point taking fish all the way along on an orange lure on a floating line. Graham Child also enjoyed hectic sport catching fish after fish. Included in his catch were 3 double figure rainbows! The majority of Grahams trout were caught at Davy Jones on cormorants on a slow sinking intermediate line. Out on the boats there were also many trout caught from many areas. Steve Bland and Bob Fitzpatrick were amongst the fish all day whilst drifting all over the northern end of the lake. Bob and Steve caught all their fish on nymphs and diawl bach washing lined on a midge tip line. Elliot Horrocks amassed a true cricket score. He caught fish all along the east bank and found the trout not too picky as to which lures they took fished either on a floating or sinking line. Neil Heath had a super day catching fish along the east bank and willows. He caught on a mixture of flies and lines. 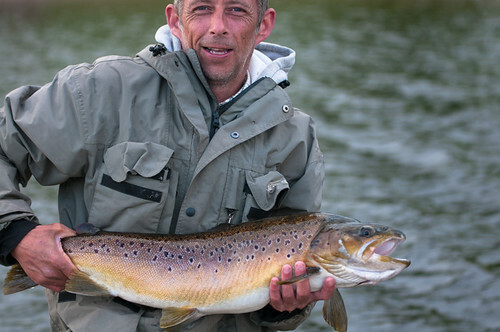 Included in Neils catch were 2 trout weighing 9lb and 9lb 8oz and a tagged trout, thats a £50 tackle voucher for you Neil! Neil Ashworth and Frank Bond were another successful boat. They caught their fish in many areas and on many tactics with rainbows weighing 11lb 8oz for Neil and 9lb 4oz for Frank. Syotw Paul. This entry was posted in Stocks Reservoir Fishing Reports on April 27, 2017 by staff. This entry was posted in Stocks Reservoir Fishing Reports on April 26, 2017 by staff.